I had some time over the long weekend to tweak a Metasploit script I’ve had lying around for a few months years. When I wrote the Python prn-2-me script I also drew up the basics of a printjob MITM module for Metasploit but never managed to finish it up. The Python version is limited in that it was designed to handle RAW print streams only… it was also really badly written (like most of my early Python stuff). 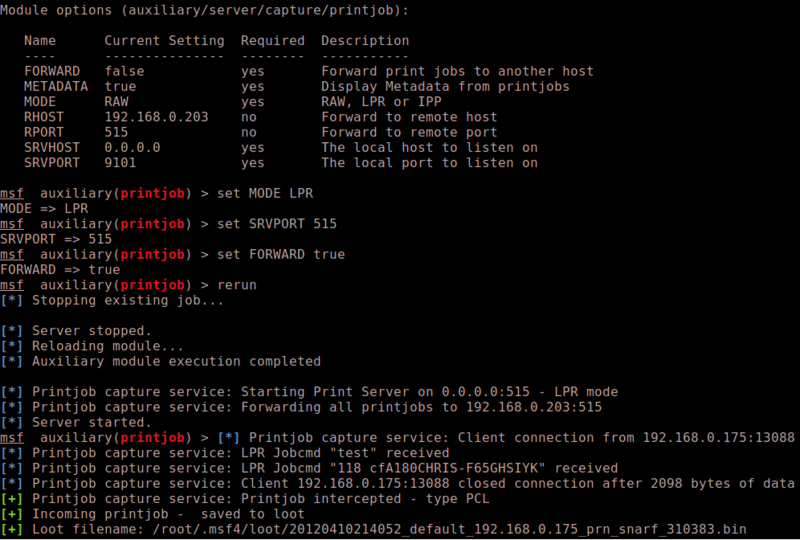 The Metasploit Module I’m testing currently should also handle LPR/LPD printjobs by sitting in the middle and passing communications backwards and forwards between the client and the printer. I’ve also begun to look at implementing some IPP sniffing as well, using the same technique as LPR/LPD (streaming the data to the printer and sniffing out the printjob and Metadata). This is still a work in progress, and handling LPR/LPD and IPP is a bit more tricky than RAW printjobs. A couple of helpful folks have been testing out the module for me… if you want to assist please take a look at the module and see what you think (download link below). If you have any problems please do a packet capture so I can see what’s not working correctly and adapt the module. As the various printers and drivers handle things slightly differently the idea is to look at as many models as possibly (not just HP!). Metasploit auxiliary/server/capture/printjob_capture.rb –> In Development! Well it’s been a while since I wrote about man in the middling printers (original post here), but I’ve not been totally ignoring the subject. After releasing the UA-Tester tool and writing a few small scripts for things like scr.im, I went back and had a look at the printer MITM topic with a mind to writing up a tool (in python obviously) to automate some of it. The result is a workable PoC tool called prn-2-me (mostly because it was late, and all creativity was long gone… sorry, no snazzy title this time!). 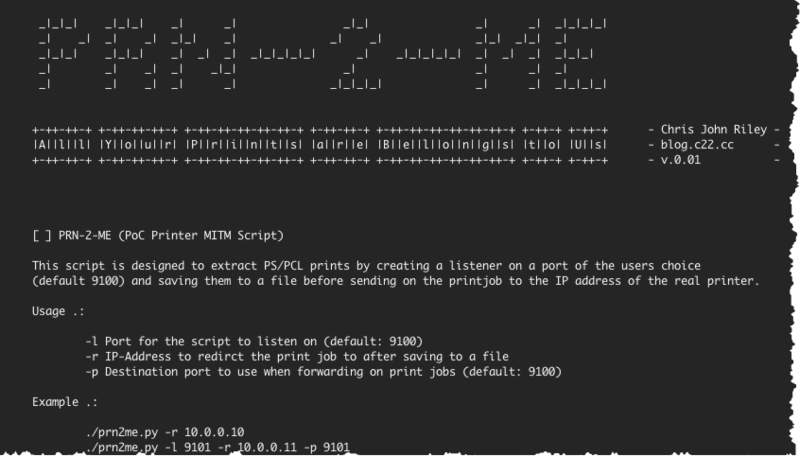 PRN-2-me is a simple listener that can be configured to run on any port (default is 9100 for jetdirect style connections). 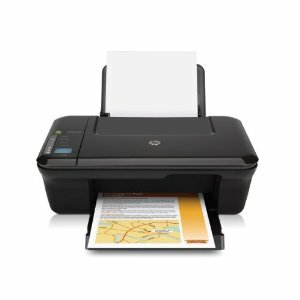 The tool will then save all incoming PCL and PostScript print jobs to file and forward them on to the real printer. Now that you’ve got the print jobs saved to disk, it’s a simple task of sifting through them and seeing what nuggets of gold you’ve captured. Postscript (PS): The simple format… you can open .ps files in most operating systems without any specialist software needed. Click and run… These files are also a LOT better quality than the PCL alternatives. If you don’t believe me just check out the samples. PCL: Not so simple… PCL isn’t well supported when it comes to viewers. However all is not lost. There are 2 options here. The script is available for download HERE or in the tools section. The tool is licensed under a mixture of BEERware (where you buy me beers if you like the tool) and FEEDBACKware (where you tell me how crap it is so I can make it better). Enjoy!